Porters unloading humanitarian supplies from the Mi26 helicopter in Jiech, South Sudan. Two United Nations agencies have reached more than half a million people, including 100,000 children under the age of five, in the most remote and conflict-hit areas of South Sudan with life-saving supplies and services. Using a combination of airdrops and airlifts, the joint emergency mission carried out by the World Food Programme (WFP) and the UN Children’s Fund (UNICEF) delivered food assistance and nutrition supplements, well as health support, learning materials and water, sanitation and hygiene supplies. Both agencies also provided nutrition screening and treatment, as well as information and messages on nutrition, according to a news release issued today. They also assist with reunification for children who are separated from their families, or unaccompanied. With support from logistics and telecommunications specialists, the teams provide a lifeline to desperate communities in the three conflict-affected states – Jonglei, Upper Nile and Unity. The teams stay in each location from 8 to 11 days, carrying all their own supplies, including food, water and tents. Based on their assessment of the needs of the local population, which can be up to nearly 50,000 people per mission, the teams radio for supplies to be delivered by air. Missions can be delayed by bad weather, which disrupts flights and causes dirt airstrips to flood, and insecurity is a constant challenge, the agencies noted. But once a team has reached an area to establish a humanitarian response, non-governmental partners are frequently able to remain and provide ongoing assistance. “Our staff deployed across South Sudan, in gruelling and often dangerous conditions, show great determination to serve the people of South Sudan with life-saving food and nutrition assistance,” said Joyce Luma, WFP Country Director in South Sudan. Of the more than 1.8 million South Sudanese who fled their homes because of the conflict that began in mid-December 2013, over 1.4 million remain displaced within the country. Most are sheltering in remote and hard-to-reach areas, and more than half of them are children. There are also some 97,000 civilians continuing to receive shelter at UN sites around the country. The UN Mission in South Sudan (UNMISS) said that more than 9,000 displaced civilians have moved voluntarily from its Tomping Compound in the capital, Juba, to a protection-of-civilians site adjacent to the UN House since it opened in June. The number of uprooted still living in the Tomping site now falls under 4,000. Yesterday, the Secretary-General’s Special Representative and head of UNMISS, Ellen Margrethe Løj, visited Bor, the capital of Jonglei state, where she met with government officials, including the caretaker governor and community leaders representing some 2,700 displaced people living in UNMISS protection sites outside Bor Town. This was her third visit to a state capital outside Juba since she took on her position earlier this month. 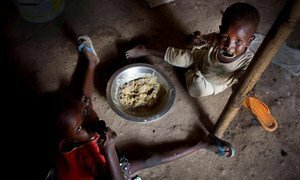 Thousands of children under the age of five are at risk of dying from malnutrition in South Sudan and 1.5 million people will be in crisis and emergency food insecurity levels from September through December, warned the United Nations Children’s Fund (UNICEF) today.